Apparently the “helmet” doesn’t fit on your head, but you can use it to hold your favorite cookies. Nice idea? Let’s go on checking the Star Wars Darth Vader helmet cookie jar. This is an officially licensed and pretty cool cookie jar themed by Star Wars. 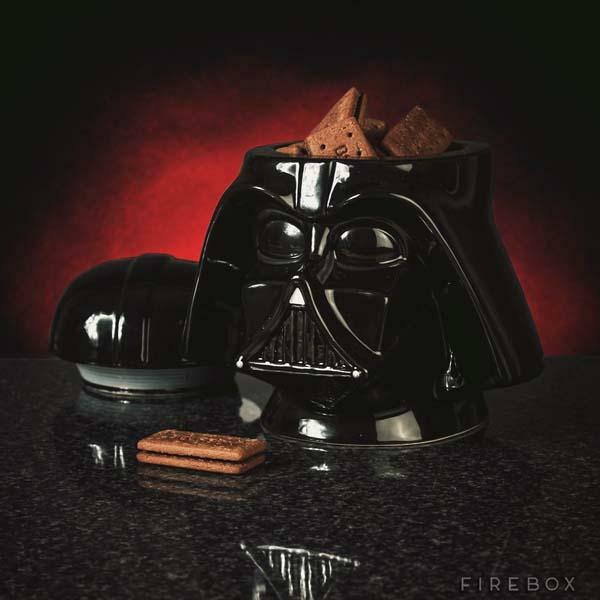 As shown in the images, the cookie jar is shaped as Darth Vader’s black helmet and features exquisite detailing from its original design the universe of Star Wars. Moreover, the glazed ceramic cookie jar measures 20cm diameter and features a runner sealed lid in order to offer a completely air-tight storage room that keeps your biscuits from going chewie. The Star Wars Darth Vader ceramic cookie jar is priced at $55.89 USD. If you’re interested, jump to Firebox online store for more detailed description.